Much of the emphasis given to strategy focuses on strategic planning and, while planning is very important, strategic plans are of no use unless they are successfully executed. Unfortunately, it is much easier to sit in an off site session and go through the intellectual exercise of developing a strategic plan than it is to roll up your sleeves and turn these ideas into action that lead to results. This is evident in the poor success rate of strategy execution, which is estimated to be in the 10-30% range according to Fortune magazine. Effective strategy execution requires a multi-disciplinary approach, most notably combining project management and organizational development principles. Couple this complexity with the dedicated focus that is required to manage strategic growth and improvement projects over and above day-to-day operations and it is no wonder that businesses struggle in this area. 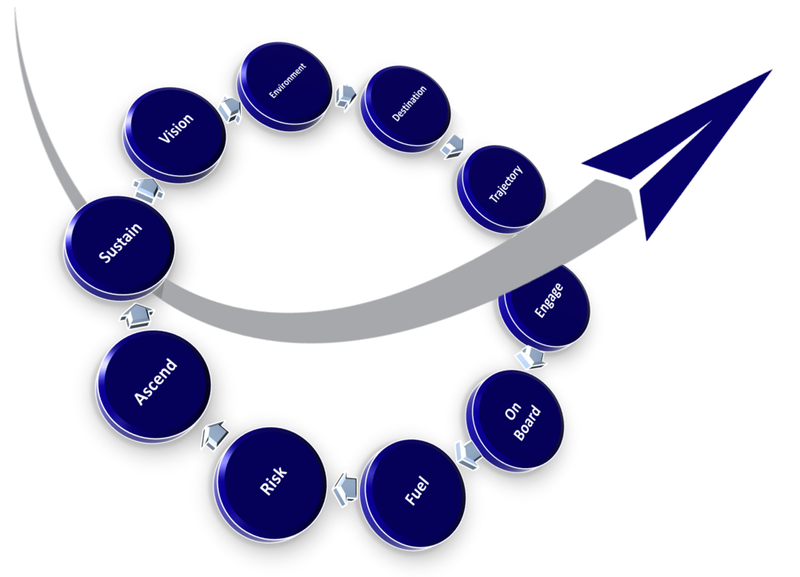 In this post, I will provide an overview of the trajectorE Navigation System (tENS), which is a scalable 10-step framework for effective strategy execution. 1. Long Range Vision. Strategy starts with the company’s purpose. This is typically documented in the Mission, Vision & Value or the equivalent foundational principles used by the organization to guide decision making. Yes, those words posted on the wall actually mean something and you should refer to them regularly, and certainly to guide strategy setting. Before setting goals or establishing any sort of a plan, you need to perform an honest comparison of the organization as it exists today against the MVV, including perspectives from all areas and all levels of the business. 2. Check the Weather. With an understanding of where your business is with respect to your long term vision, you now need to understand where your business is with respect to the present-day real world. This includes an assessment of your customers, your competitors and the environment in which you are operating. There are a number of tools available for this (NOISE, SOAR, SCOPE, etc.) with the most common being the Strengths, Weaknesses, Opportunities and Threats (SWOT) analysis. Each one has its benefits and the situations to which it is best suited, however the intent here is to ensure that the strategy setting process is done with an understanding of both the internal and external context facing the business. 3. Set Your Destination. Now that you understand where you are, it is time to start thinking about where you want to go as a business. A good way to articulate this is by describing where you want the business to be in 3-5 yrs time. This is narrower and more tangible than the Vision statement and can take the form of qualitative statements and/or quantitative targets. A gap analysis can then be performed to identify the problems that need to be tackled to close these gaps. This exercise may be straightforward or may require in-depth scenario analysis to determine the best course of action. The outcome of this exercise establishes the strategic themes, which need to become the focus of the organization throughout the rest of the execution process. 4. Plot Your Trajectory. Once the themes are established, they need to be further refined into actionable, SMART goals (Specific, Measurable, Achievable, Relevant & Time-based). Multi-year goals should be broken down into annual objectives in order to make them more easily disseminated through the organization. These goals will form the basis of your Balanced Scorecard. The Balanced Scorecard is a tool that categorizes your strategic objectives into 4 groups: customers, internal business processes, growth & learning and financial. This will be your tool for monitoring the outcomes of the remainder of the execution process. 5. Engage the Organization. Building alignment behind the company’s strategy is cited as the single biggest contributor to closing the strategy-execution gap in a survey conducted by Strategy&. This emphasizes the importance of communication to the success of strategy execution. It is very important that the entire organization understands the destination and the strategic themes that will take them there if they are all going to pull the company in the same direction. Despite the best of intentions, effective communication doesn’t happen by accident and the best way to ensure the message is getting out is to develop a communication plan that defines the audience, communicator, medium, timing and key messages. This is an opportunity for real felt leadership, since the organization needs to hear passion from the leaders of the company when describing the vision in order to feel anything close to that level of passion themselves. While face to face verbal communication is the best medium, this may not always be possible and so electronic communication vehicles like intranets, email and newer tools like Facebook's Workplace platform are all tools that can be used to create engagement. You may be thinking that a communication plan is unnecessary paperwork, however it is not the end result that is as important as the fact that it forces the planning process and aligns leaders on key messages. Trust me, you won’t be sorry that you spent the time on this. 6. Get Everyone On Board. With the business objectives set in the Balanced Scorecard and the organization engaged, the next step is to get them to internalize these high level objectives and take ownership of them by breaking them down into team-level goals. This is an important step, where the approach is more important than the product. Engaging the employees who will be responsible for executing team goals in the development of these objectives is more time consuming than having them developed by leadership, however this investment in time is well worth it since the buy-in gained here from the workforce dramatically increases the probability of successful execution. The team leader should serve as a facilitator of this process and ensure that team goals do in fact roll up to the Scorecard. As part of this process, the team needs to assess the impacts of the new strategy on its people, processes, budget & infrastructure and identify the activities required to achieve these objectives. 7. Fuel the Plan. While the accountability for the execution of all these activities is distributed throughout the organization, it needs to be managed centrally as part of a project plan with accountabilities, timelines and interdependencies well defined. If this isn’t coordinated effectively then frustration will ensue, momentum will be lost, and the strategy will fail. According to the Harvard Business Review, companies miss out on 37% of the financial performance their strategies promise because of breakdowns in planning & execution. The plan must have input from all affected teams since it must be a plan that belongs to the organization as a whole and everyone must buy into it. At this stage, the objectives developed by each team should be reviewed together with the Balanced Scorecard to ensure alignment vertically and horizontally across the organization. The Balanced Scorecard objectives are lagging indicators and will measure the results of the plan being executed. These need to be complemented with leading indicators, which are project execution metrics. In order to drive the right behavior, over-communicate the progress that the organization is making against the plan and link these metrics to employee compensation. This will cement this work as a priority in addition to the business’ day-to-day performance measures and ensure that all employees stay motivated toward success. 8. Don’t Risk It. Once the plan is defined, perform a risk assessment to identify and treat the risks to successful execution. These risks could be internal to the organization or external but both are equally capable of derailing the implementation. This is best done in a group setting with a cross-section of the organization to get a 360 degree view of the business. Once risks are identified, they each need to be ranked in terms of probability and impact, which will help you prioritize the action you take and decide whether to transfer, avoid, mitigate or accept each risk. 9. Ascend. Now, go ahead and do it. Sounds easy right? Ask any project manager how easy it is to execute a plan and they will tell you it is harder than it sounds. This plan will be particularly challenging since accountability is distributed across the organization. This makes getting the work done more challenging however the value of this approach is in the sense of ownership and therefore buy-in for the new strategy that the entire organization will feel. Frequent communication of progress and celebrating successes, even if they are small, is important to sustaining momentum. In particular, when the lagging Balanced Scorecard metrics start to move in the right direction, this should be highlighted and explicitly connected to the strategy execution. As the plan is being implemented, be comfortable with the fact that it will change. Some managers resist change, however when implementing your strategy, change needs to be welcomed, but managed. Changes will mean that your organization is starting to better understand what is needed to successfully implement your strategy. Remember, we aren’t implementing this strategy for the sake of following a nicely packaged plan; the driver is business performance. As you near completion of the ascension phase, you should be seeing the effects on the Balanced Scorecard. Congratulations! … but you’re not done. 10. Sustain Your Altitude. It is very easy to fall into the trap of celebrating the successful achievement of executing your strategy and then allowing standards to slip back into old habbits. You want to think of this achievement as getting close to the top of the S-curve of performance, rather than hitting a peak in performance only to drop off shortly after concluding your ascension. The risk of this occurring depends on the type of change undertaken and is more likely for productivity improvements than, for instance, new product launches. The onus is on leadership to continually reinforce the culture change and maintain discipline in holding themselves and the organization to the new standards. Embedding these expectations in the Balanced Scorecard, team-level KPIs, incentives, individual performance coaching and management routines is required to maintain the new standard for performance. We have only scratched the surface of the tENS model, an industry-agnostic framework for strategy execution. With a clearly articulated trajectory from current state to the end goal, early engagement from the organization, a robust plan and disciplined execution, any business can successfully convert their strategy for growth or improvement into tangible business results. In future posts I will do a deeper dive into each of the 10 components of tENS. Subscribe to our newsletter to have future posts pushed to your inbox. If your found this post valuable, please share it with your network on your favourite platform.